Orig. as open-pollinated ‘Stuart’ seedling in Monticello, GA, selected by G. T. Chaffin in 1945. Introd. in 1955. 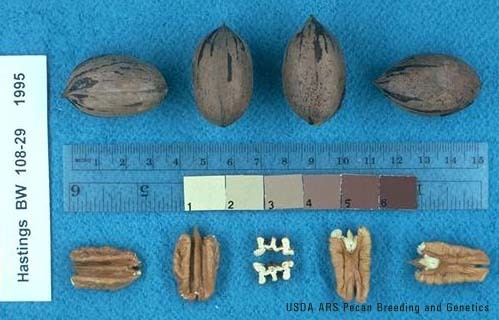 Plant patent 1399 issued June 14, 1955; assigned to the H. G. Hastings Co., Atlanta, GA. Nut: oblong elliptic, with acute apex and obtuse base; 68 nuts/lb, 48% kernel; kernels golden in color, with wide dorsal grooves, deep and wide basal cleft, wrinkled texture. Protogynous. Extracted from here.